The key obstacle is that different sources of electricity generation used to power the battery have different GHG consequences: Hydro and nuclear release almost no greenhouse gas emissions; coal releases a great deal; and natural gas falls in between. Solar and wind, which are a small share of production, also release no greenhouse gases. This older post from Scientific American shows a regional breakdown of the greenhouse gas emissions from electricity generation. One of the challenges of redesigning the EPA label for US cars was creating a common way of evaluating GHG consequences across car technologies: Gas-powered, Hybrid, Plug-In, and Plug-In Hybrids. One decision was to use MPGe--which is a terrible measure, because it has all the problems of MPG, and adds new problems by ignoring the cost and GHG effects of the energy input in the denominator. 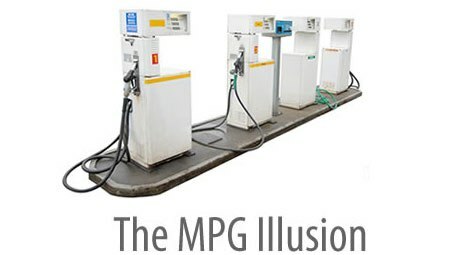 See this earlier post for a brief explanation of the flaws of MPGe. 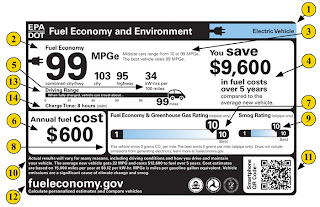 As this label shows for a plug-in, one of the key decisions the EPA made was to focus only on "tail pipe emissions" in figuring the Greenhouse gas ratings. Thus, a plug in vehicle emits "0 grams of CO2 per mile". This is true, of course, but the electricity stored in the battery may have released a substantial amount of CO2 when it was produced. As the Scientific American post noted, the amount of CO2 released in producing electricity varies widely by region in the US. The interface allows you to enter your zipcode and then select an electric vehicle based on year and name. It then shows the CO2 emissions from that vehicle powered by electricity from your region, powered by electricity as a national average, and powered by gasoline (for a 22 mpg vehicle). The site promises that a future version will allow more customization (e.g., for plug-in hybrids, allowing the mix of driving that uses electricity or gas to be matched to your own use).This link takes you to the assumptions in the calculations. The "Average New Vehicle" bar on the left assumes a gas-powered car that gets 22 MPG (roughly 5 gallons per 100 miles). Conservatively, the Prius gets 45 MPG (roughly 2.5 gallons per 100 miles), and emits half the CO2 shown for the "Average New Vehicle." The implication: A 50 MPG hybrid has the same GHG impact as a pure electric vehicle in my part of North Carolina. 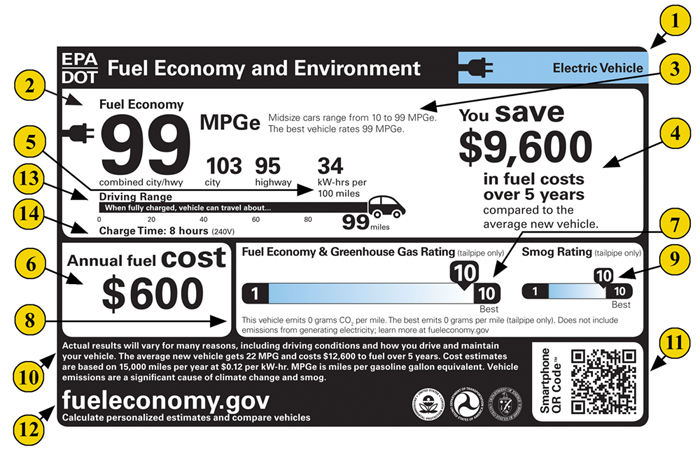 And the EPA label, as shown above, doesn't reflect the fundamental equivalence of a Prius and a Volt. They emit the same GHG.